Lip Gloss Gossip: Happy New Year!! Big News!! Happy New Year!! Big News!! Well since my last post so much has happened! I got some very exciting news to share with everyone! 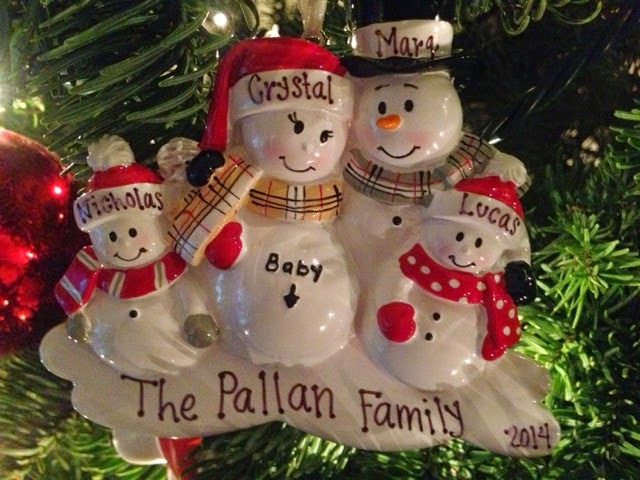 I guess I'll start with sharing the gift we gave to my family a week before Christmas! If you follow me on Instagram then you might have already seen this, but I am expecting my third baby this year. This is how we shared the news with my family. I gave them this ornament and the expression on my moms face was priceless! Everyone is so happy and excited! We also just found out last week that we are having a little girl! We are so thrilled with the news of a little girl, as we already have two boys so it is very exciting! My original due date was May 5, but it has since changed to April 27, so sometime mid Spring. We have so much planning to do, with her nursery and what not but I can't wait to get started. Since I had Nicholas three years ago I wanted to post mommy blog type of things, but I was not sure if I wanted to start a whole new blog or post on here. I could never really decide so I just never took the plunge. I have decided with this pregnancy/baby I will post mommy blogs occasionally on here. I won't be overloading you with all things baby, but I think it will be fun to share things like that occasionally. I will still post beauty related things as well. I have a couple of new drugstore lip product reviews to come so keep a look out for those! CONGRATULATIONS! Having a little girl is the best! Please keep us updated! I love mommy/pregnancy blogs! Royal & Langnickel 50% Off Sale! !